I offer a number of wedding photography packages to suit a range of budgets but each of these can be tailored or changed to meet your specific requirements. If you would like a bespoke package, please get in touch, I’m more than happy to meet up for a chat or just discuss your plans over the phone so I can provide a personalised quote for you. More details on each of the individual service inclusions can be found further down the page, but again, please get in touch if you would like any further information. Read on for more detailed descriptions of each of the package inclusions. Hours of coverage refers to the number of hours I will be present at your wedding and physically taking photographs. For example, if you wanted me present for the ceremony followed by formal photos of the wedding party this would equate to around 2 hours of coverage. If, however, you wanted me present from the ceremony right through to the first dance, this would equate to around 7 hours coverage. My Diamond package includes coverage from morning preparations, hair and make up, right through to the evening reception. Each package includes a set number of hours but it is entirely up to you which section of the day you would like these hours to cover. Every one of my packages comes with free access to an online gallery of your images. The gallery provides secure and backed up storage of your images, with password protected access, for a minimum of three years. The gallery also provides the flexibility to organise, download and share your images to social media or even order competitive print packages direct from the screen. The majority of packages also provide a USB thumb drive of all the images for you to take away and store as you choose. I provide a number of high-quality printing services from my studio for prints up to A3 in size. All of my packages include a set number of prints but you are welcome to add additional prints and sizes as you choose. 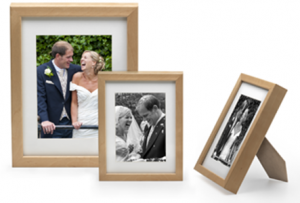 Further enhanced printing services such as gallery fine art quality prints, metallic finishes, canvas prints or sizes above A3 can be organised via a partner, along with framing services, if required. These will then be dispatched to an address of your choosing. Providing an opportunity for us to get to know each other a little better before your big day, the pre-wedding photo shoot acts as a consultation and trial run, both for you to tell me what you want from your wedding photographer, and for me to help you gain confidence in front of the camera. And of course, you’ll come away with some lovely photos of you as a couple. Find out more about my pre-wedding photography service. Up to 10 simple, point-and-shoot digital cameras can be provided for each table during the wedding breakfast. This gives your guests a chance to take their own shots, a brilliant way to capture the fun and shenanigans of the day! Prints will also be provided for any of the photos you choose. Many couples like to provide a guest book for their guests to sign throughout the day to capture all their well wishes and serve as a meaningful memento of those who were present on their big day. For those couples who have enjoyed a pre-wedding or engagement shoot, I can provide a 20 leaf A4 signing book to include all the best photos from your shoot, adding that extra personalised touch to your guest book. Alternatively, I can include a selection of your own personal photos from your time together as a couple. A 20-page A4 album of your favourite prints for you to flick through and share with friends and family. Premium: fully-attended photo booth with instant prints and prop box for the duration of 4 hours plus up to 100 6×4 prints and an album containing up to 200 of the photos taken on the night. Find out more about the photo booth on my Island Party Booths website. There can be quite a lot of admin to contend with in the run up to the wedding, managing invitations, RSVPs and menu choices whilst also helping yours guests find the accommodation they need. As part of your wedding package, I can set up a dedicated website with a name of your choice (subject to availability), complete with WordPress blogging software and 24 hour support so you can keep your guests up to date with your wedding plans, share information on local hotels, provide maps and even include an RSVP and meal choice poll to keep things simple. The website will be available for your sole use for 3 years and can either be managed directly by yourself or updated and maintained by the Wedding Photography by John team. Wedding stationery is another important part of your day. I can provide personalised wedding stationery in a design of your choice. This package includes: 80 x save the date cards 80 x wedding invitations 80 x order of service 4-page A5 booklets 80 x place names 80 x thank you cards Where engagement or pre-wedding photo shoots have taken place, you may like to include some of the resulting images in your design. Likewise, any thank you cards after the event may include images taken on the day. A digital presentation or physical album of your life together as a couple, the slideshow contains your choice of images from your childhood, when you met, important events with friends and family and perhaps even culminating in some shots from an engagement or pre-wedding photo shoot. A charming addition to your special day, this can be shown or circulated during the signing of the register, wedding breakfast or reception and often proves a huge hit with your guests as they reminisce and laugh about days gone by. All you need to do is provide me with your chosen selection of images in digital or printed form. Those that are printed will be scanned and all are collated together into a slideshow, album or gallery to be presented as you choose. Making a booking is very simple. First you need to let me know the date of your wedding so I can confirm my availability. Once agreed I will require a small deposit which will later be deducted from the cost of your package. Once booked I’ll be in touch to discuss a pre-wedding consultation or photo shoot, but otherwise you can relax and turn your attention to your other wedding plans.